Saving the federal government – and taxpayers – millions of dollars a year, while improving quality, are just some of Paul Curtis’ accomplishments, for which he was recognized earlier this year with the AICPA’s Outstanding CPA in Government Impact Award (Federal), one of three AICPA Outstanding CPAs in Government Awards. Curtis began his career with an internship at the U.S. Governmental Accountability Office, worked in public accounting with a local CPA firm and a Big Four firm, and has been with the U.S. Environmental Protection Agency’s Office of the Inspector General since 1994. How did Curtis decide to go into accounting? What does he like about working as a CPA in government? Find out below, as Paul Curtis joins our Share Your Story series. As Director of Financial Audits in the IG’s office at the EPA, Curtis has saved the agency money while conducting high quality audits. He notes he is the only audit executive in the federal government leading an in-house financial statement audit for an executive branch federal agency, saving the agency over $1 million a year, versus if the audit were outsourced. Engagements he’s led since 2012 have identified $84.7 million in savings; however, it’s not just the quantifiable results that have meaning. It’s clear Curtis and his colleagues feel a sense of purpose in their work at EPA. 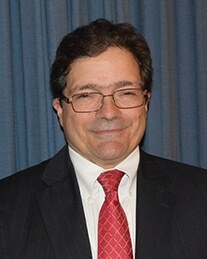 “Our high-quality audits involve national programs for protecting human health and the environment,” he notes, with his team recommending improved business operations, more accuracy and accountability for contractor-held government property, enhanced controls over billions of dollars’ worth of transactions and strengthened assurance that appropriated funding is used for the correct purposes in a timely manner. How did Curtis decide to become an accountant? Friends in his dorm majoring in accounting told him about CPA firms recruiting at the school. “That sounded good to me, so after my first semester, I switched majors and took my first accounting class,” says Curtis. And the rest – is history – er, accounting. “While an audit manager as KPMG, I was loaned out as a staff member to the Treadway Commission,” he shares. “There were a number of other staff members loaned from other CPA firms, all listed in the Report of the Treadway Commission as staff members. I worked primarily on doing research on “opinion shopping” and assisting another staff member, Mark Connelly, with the section on analytical reviews”. When speaking with his staff about career development, Curtis says he often uses an example of a ladder. “It’s very easy to be at the bottom rung of a ladder, not very far to fall, not much chance of failure. The higher up the ladder you go, things get more daring, and the fall is longer and harder,” he notes. And, while it can be tough to get to the top of the ladder, it can be even tougher to stay there. “It is up to the person whether they will be at the bottom and just get along, or try to make a difference and strive for that top rung of the ladder,” says Curtis. How have MACPA and AICPA membership supported you in your career? He expresses gratitude to the AICPA for recognizing him with the Outstanding CPA in Government Impact Award, adding, “Recognition by your peers for the work that you do is the highest compliment.